It is called “model” rocketry because the rockets are typically built by the hobbyist -much like model airplanes and other things are built. So, one of the best aspects of the hobby is that there are two distinct phases. The first phase is the building of the rockets and the second phase is the launching of the rockets. A Model Rocket Kit: There are lots of different rockets you can build and how you build it will depend on the kit you buy. Many of these will be available for purchase from vendors at ROC launches, including Discount Rocketry and Bay Area Rocketry. You may also be able find them at some toy stores and at hobby stores such as Michael’s and Hobby Lobby, or online. Estes Model Rocket Kits are very popular! So are Quest Aerospace rockets. 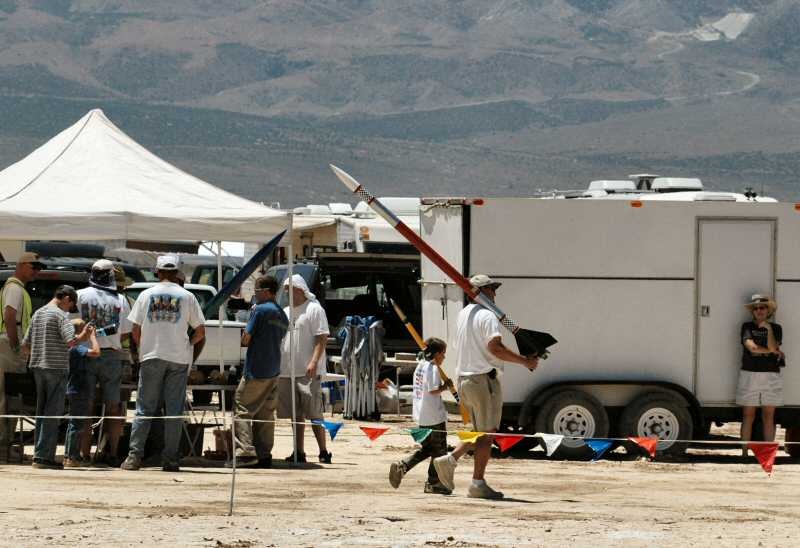 Somewhat bigger “Large Model Rockets” are available from Aerotech. There are different skill level kits available, and most beginners should start out will simpler rockets and then work up. It’s not that hard and it is a lot of fun to build your rockets. Each one should come with complete step-by-step instructions. Model rockets are light weight, rocket powered vehicles, made of paper, balsa wood and thin plastic castings. They use professionally manufactured, single use engines made of paper tubes with clay nozzles or plastic. These engines are less flammable than cans of model airplane fuel. A few newer, reusable engine casings are made of metal, but they are carefully constructed to blow out the end plugs instead of blowing off fingers.The Estes Alpha shown here is a good example of a first model rocket. It is 12 inches tall, 1 inch in diameter and weighs 0.8 oz without an engine. Model rockets all have a recovery system that changes the configuration of the rocket when it reaches the peak of its trajectory. The configuration is changed so that as the rocket returns to earth it does not do so as a ballistic vehicle. The configuration is changed by either making the rocket unstable (popping off the nose cone) so that it tumbles, using a parachute or streamer to slow it down, or by changing it into a glider. 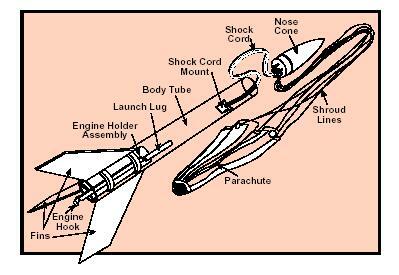 This shows the basic design of a simple Estes rocket (from the Estes Model Rocketry Technical Manual).The following image shows a standard flight profile for a typical model rocket that uses parachute recovery.